I can remember my dad taking us the Milk Bottle many a nights for ice creme when I was young. It was located where the parking lot across the Pensacola Civic Center is now located. I think that would be the corner of Davis and Gregory Streets. I do not remember ever going inside and eating … I can only remember driving up in the car and I believe someone came out and took your order. And I do not think that they were on roller skates! Let us hear your memories from the Milk Bottle … thanks for looking. My Daddy Mike used to bring me to the milk bottle for ice cream 1945-49. We always went inside. But… my first milk shake was at Doggetts Drive In. Thought I’d died and gone to heaven. Many, many fun memories of family trips to the Milk Bottle when I was a sprite in the late 50s. 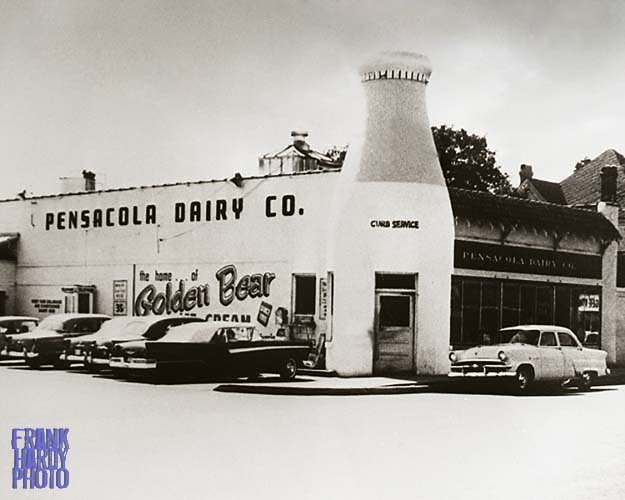 Frank, I cannot remember why I associated Pensacola Dairy with the Eskin family. But Baer certainly is a well-known name there. What about Baldwin Dairy? Wasn’t it on the west side of town? This is my 57 ford convertable with mercury cruser fender skirts, my wife and I worked in town and used to our eat lunch here. If you notice you see my wife looking back at the camera, I had told her she was getting her picture made. I remember the photographer over in a vacant lot with one of those large cameras on a stand taking the photo. I was told a few years back the large original photo is hanging in a lawyers office down town. I have a lot of fond memorys of thet car and dairy. Loved the Milk Bottle Tuttie Frutie Ice Cream flavor. Also, there were booths inside with Juke Boxes where you could pay 5 songs for a quarter. Lots of fun for .25! I remember the great milk shakes. I think the first one I ever had was from there. We were from Brewton and a trip to Pensacola was a rare treat. No trip to P’cola was complete until we had gone to the “Milk Bottle” for shakes. We always sat in the booths. (Ca. mid ’50’s.) Broke my heart when they tore it down. we ate here sometimes after a day at the beach, or some lucky nights went down for ice cream. my grandmother introduced me to buttermilk ice cream, this was one of the few places that had that. Buttermilk ice cream and the great milkshake made with it! Memories.